Remove the rear console box (see page ip-16). Refer to the procedures from the removal of the no. 1 Console upper panel garnish up until the removal of the rear console box sub-assembly. Remove the lock nut and wire adjusting nut. Disconnect the no. 1 Parking brake cable from the parking brake equalizer. Remove the 2 bolts and parking brake lever (with the no. 1 Parking brake cable). Disconnect the cable from the lever. Remove the screw and switch from the lever. 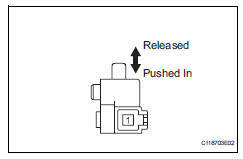 Install the parking brake switch with the screw. Connect the cable to the lever. Install the parking brake lever (with the no. 1 Parking brake cable) with the 2 bolts. Connect the no. 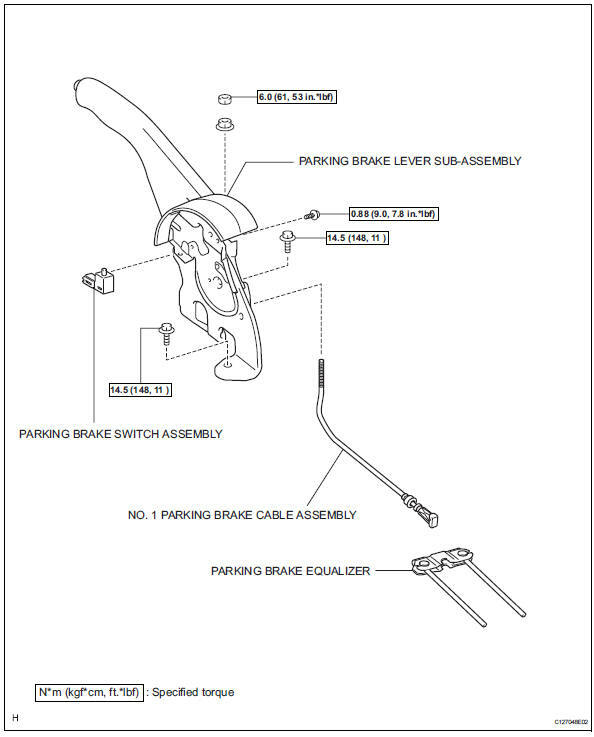 1 Parking brake cable to the parking brake equalizer. Temporarily install the wire adjusting nut and lock nut. Install the rear console box (see page ip-23). Refer to the procedures from the installation of the rear console box sub-assembly up until the installation of the no. 1 Console upper panel garnish.